For Dominic Bartola, growing up with bilateral severe to profound deafness was not easy. It meant feeling isolated from peers and struggling to communicate in a group. However, the implications of living in a silent world became more apparent for Dominic as he transitioned through college and adulthood. 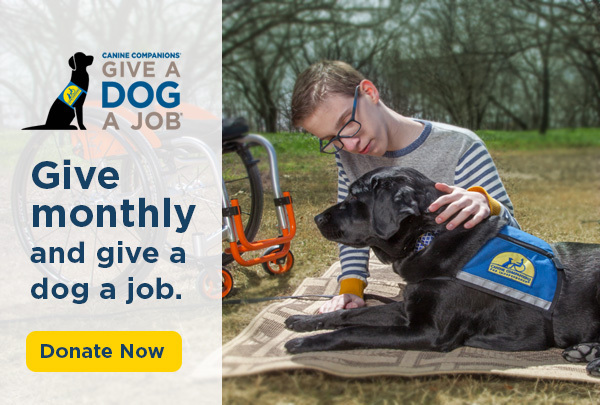 Dominic made a decision that would change the way he lived his life with hearing loss — to apply for a hearing dog from Canine Companions for Independence. In 2013, Dominic received Hearing Dog Plato III, a yellow Labrador, entirely free of charge. Plato, like all Canine Companions hearing dogs, is trained to alert Dominic to sounds in his environment with an insistent nudge to the leg and then lead his handler to the source of the sound. Plato is Dominic’s connection with the world around him, alerting him to the doorbell, a knock on the door, alarms and even to someone calling Dominic’s name. He provides peace of mind, always letting Dominic know something important is happening with a nudge of the nose. 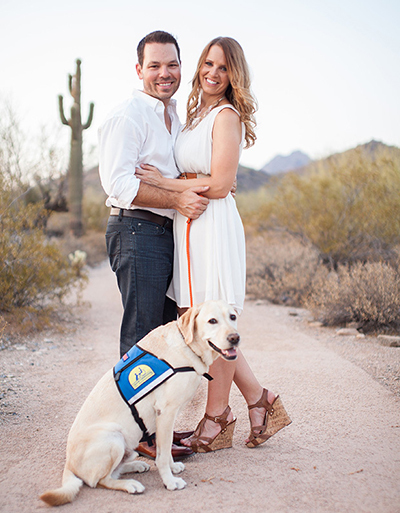 Dominic credits Plato for introducing him to his wife, Melanie, who fell in love with the guy on four legs at first glance, using her connection to Plato as a deeper introduction to the human half of Team Bartola.